Almost everything is under $100! I'm re-wearing the ponchos I've had for ages + I've got major shopping fever for all the cute options available this year. H&M / Nasty Gal / New York & Co. I have the boots in gray, and I'd love a suede jacket this year. I have three wool hats in three colors (from 1-3 years ago) that I'm wearing on repeat. I ordered #2 and #3. I especially love the dresses with sleeves. Express / New York & Co. I have a tie neck blouse (similar to #1) that's currently on repeat in my closet. 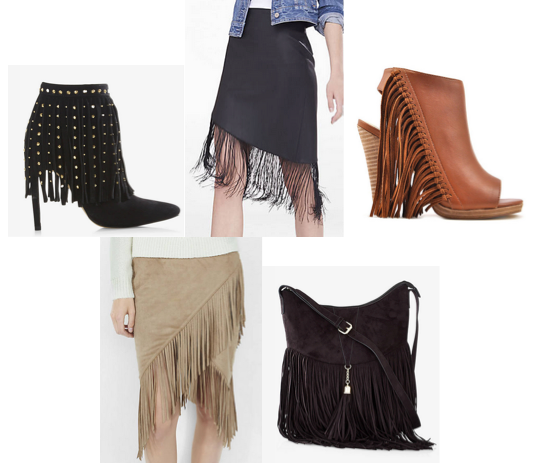 I'm wearing my fringe clutch from last year, plus sale stalking this Express fringe skirt. I'm planning to order #2 asap, and I ordered these from New York & Co. I have trouble finding boots that aren't huge on my calves so hopefully they work in person. Aka anything fuzzy. I bought vest #4, and vest #2 is on my wish list. I own #1 and #3. I've added a couple plaid scarves to my closet recently. Which fall trends are YOUR favorite?